This is a recent SUCF window replacement project for the SUNY Oneonta campus. Bugbee Hall is a traditional 3 story brick and limestone school building. The original windows were large white oak double hung windows that were in a poor condition and in need of replacement. RHBPC evaluated the conditional and presented 3 options for the repair of the problems. After consideration and review a complete window replacement solution was selected. 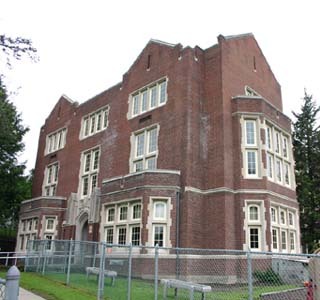 RHBPC presented the project to NYS OPRHP for review as Bugbee Hall is listed on the register as a building of historic significance. RHBPC provided complete design, bidding and construction services through the completion of the project.